Geometry in the large sense, and especially the geometry of the most natural and simple structures on manifolds, is going through a golden age. More than ever, we are close to a satisfactory understanding of the basic blocks that constitute the most intricate spaces, be they Riemannian, complex, algebraic, symplectic or dynamical. Contemplating this development, one sees the ubiquitous role played by extremality and stability understood in various contexts: the proof of the Poincaré conjecture and the parabolic methods that reach minimality in low-dimensional manifolds place us roughly at the point where mathematicians were at the end of the nineteenth century when one had to invent, beyond the analytical method of uniformization, a full topological theory needed to achieve a satisfactory classification. Minimality and extremality are also present in higher dimensions, both in the Kähler-Einstein case and in the constant scalar curvature Kähler case, where Aubin, Yau, Tian and Donaldson established basic existence theorems. Extremality is also behind the recent spectacular proof by Taubes of the full Weinstein conjecture on the existence of closed orbits of the Reeb flow on contact manifolds. Although his proof relies on a subtle interplay between the contravariant Seiberg-Witten theory and the covariant embedded contact homology, the conjecture itself and ultimately the idea of its proof, relies on the minimality of an action associated to some closed trajectory that can also be computed as a capacity. 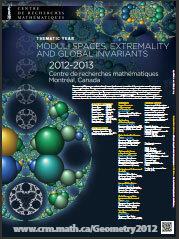 In symplectic topology and geometry, the progress over the last decade is remarkable on almost all important questions: while relative symplectic field theory, considered by some mathematicians to be the ultimate theory of classical and quantum mechanics, is developing quickly with tools coming from several parts of mathematics (analytical foundations, algebraic formalism, geometric intuition and setting), advances on all aspects of the ubiquitous Floer theory are now percolating in 3 and 4-dimensional manifolds. Almost independently, the theory of J-holomorphic curves has been used to derive real enumerative invariants, opening for the first time the field of enumerative real algebraic geometry that had, until then, stagnated since its infancy almost two centuries ago. Moduli spaces are present everywhere: the spaces of metrics, be they Kähler or almost Kähler, the space of almost complex structures, the space of representations of the fundamental group of surfaces or 3-folds in suitable Lie groups and the so-called higher Teichmuller spaces, the Hamiltonian diffeomorphism group over which the Hofer norm is given, the space of configurations of the so-called Clusters, a sort of dual to the Fukaya A?-structure, the space of pseudo-algebraic functions on algebraic curves that are mysteriously connected to integrable systems, random matrices, Gromov-Witten-invariants, all of these spaces are currently attracting the attention of the mathematical community more than ever before, with an interdisciplinary perspective that is now, clearly, essential. 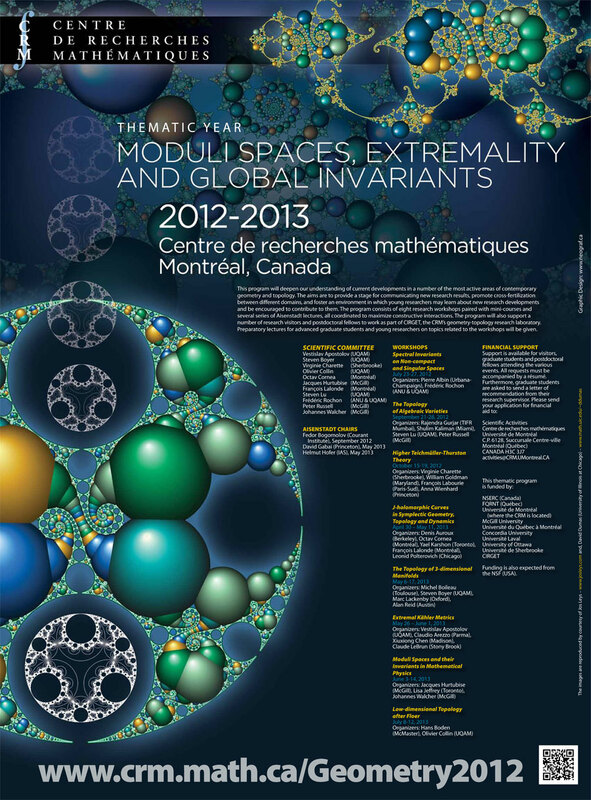 The theme year on "Moduli Spaces, Extremality and Global Invariants" will be a hub dedicated to the study of these questions that lie at the heart of the current developments in geometry. The program consists of eight research workshops paired with mini-courses and several series of Aisenstadt lectures, all coordinated to maximize constructive interactions. The program will also support a number of research visitors and postdoctoral fellows to work as part of CIRGET, the CRM's geometry-topology research laboratory. Preparatory lectures for advanced graduate students and young researchers on topics related to the workshops will be given.